Tailored to homeowners interested in going solar, this free workshop outlines the fundamentals of solar electricity and solar water heating. Learn how to reduce or eliminate your electric and gas bill with clean power and find reliable solar contractors in your area. Experts from the Center for Sustainable Energy (CSE) will explain the fundamentals of solar electricity and solar water heating and share valuable consumer awareness tips that will help you feel confident when evaluating solar technology for your home. CSE representatives will be available before and after the workshop to answer your specific solar questions. After attending “Solar for Homeowners,” you will have the knowledge and resources necessary to make that final decision to go solar! Refreshments will be provided for registered attendees. This event is for homeowners. 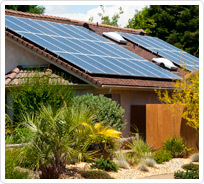 If you are a solar contractor, please attend one of our contractor workshops. Can't join us on this date? Check out one of our other solar workshops.